Give you the opportunity to discuss the problem with those concerned, if you wish to do this. 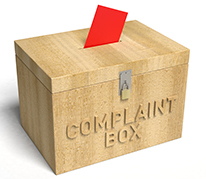 We offer a practice-based complaints procedure to deal with any problems you may experience with the service we provide. A copy may be obtained from reception. All complaints are to be addressed to Colin Stears, General Manager.